The subject of ‘Nature’ brought the idea of a bluebell wood to mind straight away, I love the colour combination of the bluebells and the fresh springtime green. 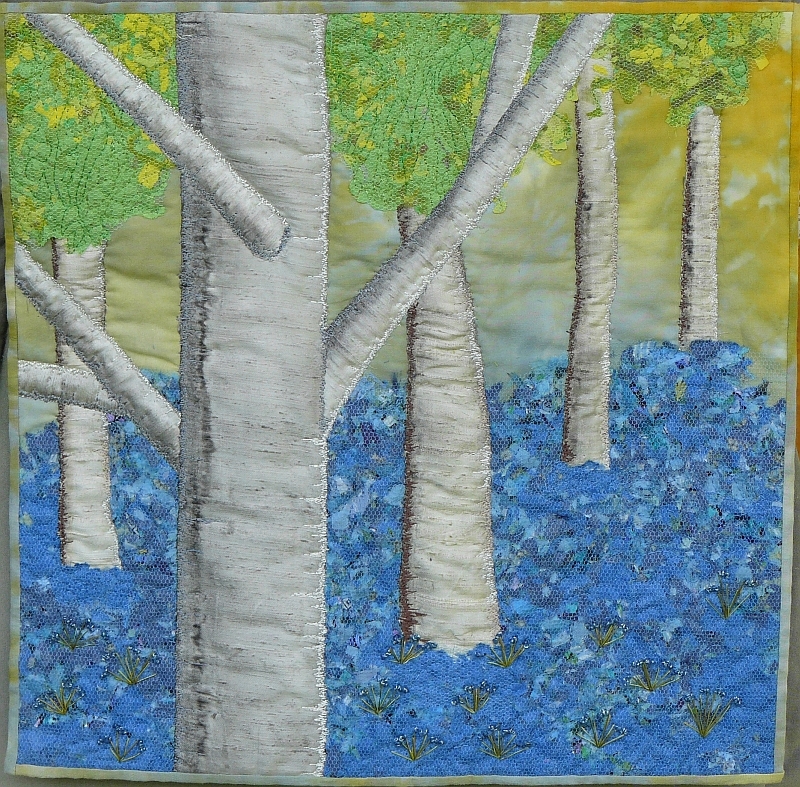 The background is a piece of snow-dyed madras cotton, the leaves and bluebells are built up with the confetti landscape idea and the tree trunks are painted silk. The idea of using the texture of the silk as the tree trunks is something I have been working on elsewhere, here I felt that the shades of the silk gave enough texture without adding too much stitching. I have added some plants to break up the rather bold mass of bluebells. Time was tight and I wanted to produce something in a very short space of time; I am happy with this rather simplistic, idealistic effect. Your interpretation of a bluebell wood is interesting…at first (quick) glance, it’s as if the sky came down to earth. I love the bluebells. Beautiful Caro. Your use of silk to create the tree barks is very creative….an idea I will keep in mind for the future.